Iván Fernández has graduated in Computer Engineering! 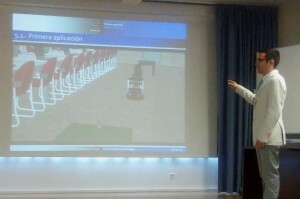 Today, Iván Fernández has presented and defended his final thesis for the Computer Engineering degree. In the past months he has done a great work with setting up the V-REP simulator of CRUMB and its connection with Matlab, and, today, also a really nice presentation. The evaluation committee has assessed all of that with a grade of 9.7 and a proposal for graduation with honors. Congratulations, Iván! This entry was posted in News, The V-REP simulator. Bookmark the permalink.